National University is an off-campus university in Bangladesh. It was founded in 1992 and located at Gazipur. This university is a well ranked university among all the universities of Bangladesh. Now, to know more about NU read the article below. National University is an off-campus university in Bangladesh. It has established in 1992. This university is situated in Gazipur district which is 30 km far from the Capital. It established by an Act of Parliament of Bangladesh as an affiliating University. There are 2,254 colleges associated with the National University Bangladesh. Actually, headquarter of all colleges under the National University is in Gazipur. This university offers the students BA, BSS, BBS, B.Sc., Postgraduate and Professional degrees. And, it also offers MS, M.Phil, and Ph.D. Programs. Now, existing president Abdul Hamid is the Chancellor of National University. And, Professor Dr. Harun-or-Rashid is the present Vice-Chancellor of this university. The nickname on this university is NUB. Now, it has total 159,375 academic staffs and 1,051 administrative staffs including affiliated colleges. The total number of students in NUB is 2,097,182. Among those students, 1,755,256 are undergraduates, 334,653 are postgraduates, and 184 are Doctoral students. And, ii also has 7,048 other students. Its campus is 2,254 associated colleges. And, the official link of National University is www.nu.edu.bd. The National University has 6 faculties and under them, it has 30 departments. Now, the name of those faculties and departments are given below. • Arabic and Islamic Studies Department. • Islamic history and Sanskrit Department. • Faculty of Engineering (Professionals). • Computer Science and Engineering Dept. • Electronics and Communication Engineering Dept. • Faculty of Technology (Professionals). • Faculty of Social Science. 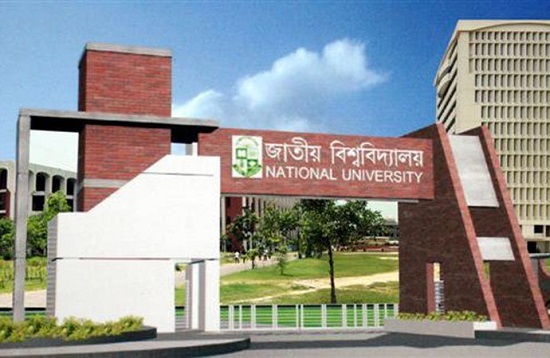 National University has ranked very high among all the universities in Bangladesh. The university ranking list of Bangladesh shows that it is in a good position for its best results. The students of National University work very hard. The ranking shows that the NU has great educational structure and environment for students. The admission process of National University is very simple now. In previous years, students are required to participate in the admission test. But, from 2016, the procedure has changed. The students don’t need to participate in the admission test for admitting at the National University. They just need to apply here. The NU authority chooses the students from their SSC and HSC grade points and marks. In the end of this article, we like to say that NU provides quality education in Bangladesh. And, visit our website for more info about National University.